Bristol at 7-months. 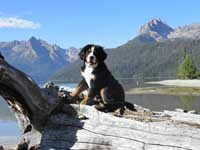 A Bernese Mountain Dog, Bristol loves to go on walks and cross country ski trips in the Big Wood and Sawtooth valleys. “It's very nice we live in a place where we can enjoy the fresh air with our dogs,” said owner Roger Buckle. Photo by Roger Buckle. It is a truth universally acknowledged that the Wood River Valley is pet mad. We love our pets to distraction, as evidenced by the avalanche of beautiful pet photos that the Idaho Mountain Express received last year for its first Valley Pets Pet Photo Contest. Well, we want more, please. We're looking for another top dog/cat/finch/ferret to grace the cover of the Valley Pets special section to be published in February. Please go to www.mtexpress.com/pets to submit a photo of your pet to the contest. The parameters are simple: The photo needs to illustrate how much your pet loves to live in the Wood River Valley. The photo must contain a pet, may contain a person and should be taken somewhere in the Wood River Valley or surrounding area. When submitting the photo, include a short description explaining how the photo represents your pet's enjoyment of life in the valley. In addition to being a cover boy/girl, the winning entrant will receive a $50 pet-related gift certificate, depending on his/her species. The contest closes on Friday, Jan. 27, at 5 p.m.